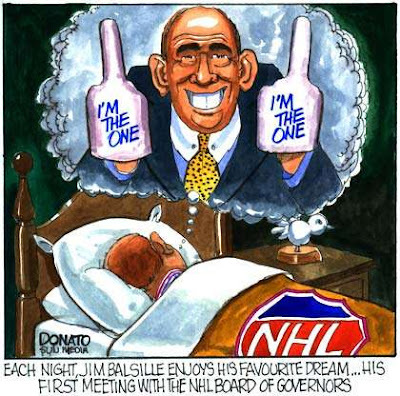 RIM co-founder Jim Balsille continues to go after the Phoenix NHL franchise like a pit bull gnawing on the postman's leg. 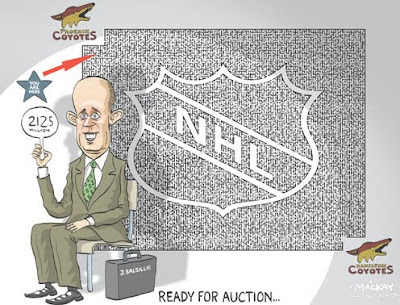 A couple of editorial cartoonists rewarded him for his efforts in their cartoons last week. 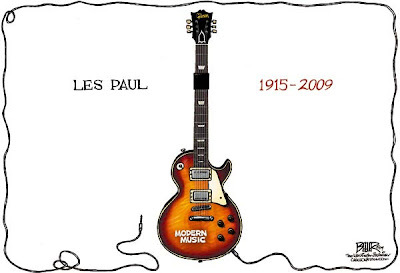 Guitar inventor and multi-track innovator Les Paul passed away late last week at the age of 94. Several editorial cartoonists took time to mark the occasion. Hey, ettarose is giving me crap! Yep, I've now won her Craption turd thingy a second time! Cool. And, your not gonna believe this. I know I couldn't. 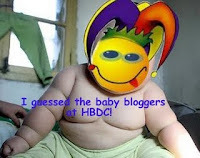 I've also won the Humor Bloggers Dot Com Guess The Baby Blogger Contest, also run by ettarose last week. Man she's one busy lady. Boy my right sidebar's getting a bit crowded over there! Thanks for these awesome awards, etta. Go to ettarose's excellent site to see both these stories. 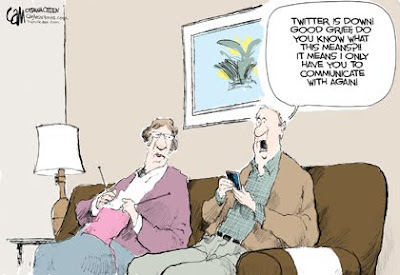 The first one about Twitter IS good! I see why your wife had a laugh. I like the last one of Les P. and Jeez too. Who knows? Maybe Jesus is indeed a superstar?! 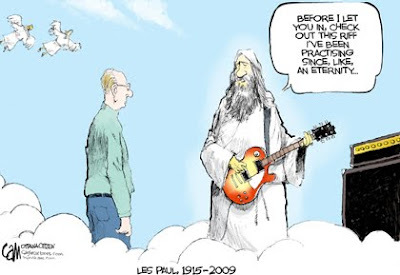 RIP Les Paul... he had a good run and a good riff. Rock on Les Paul, rock on. I was lucky enough to see some of the originals at the R&R Hall of Fame last year..what a run..
Love the funnies this week. Don: The twitter one IS good isn't it. CatLady: Indeed - an amazing guy. Winky: Thanks, you're very kind. Phillipia: Thanks on both counts.